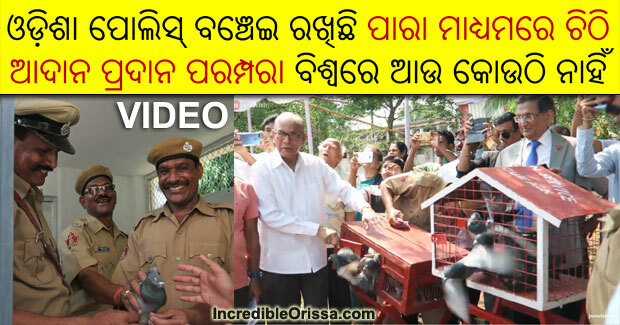 In the age of internet, 50 pigeons of Odisha Police successfully carried messages from Bhubaneswar and delivered at Cuttack covering 25 kms in less than 20 minutes, amazing many. This is the only existing pigeon carrier service in the world, which is being used for ceremonial display only. The Odisha Police Pigeon Service started in 1946 when 200 pigeons were handed over to them by the army on an experimental basis to establish communications in difficult terrains. The service was first started in Koraput district and later introduced in all districts with over 700 sturdy Belgian Homer pigeons for ferrying messages to assigned destinations. The Service was headquartered in Cuttack where a breeding centre was set up. For years, these dependable birds have been a vital link between remote police stations when traditional communications failed. These pigeons were extensively used during floods and the Super Cyclone in 1999, as radio networks were disrupted. The Pigeon Service was the only line of communication to the marooned town of Banki during the disastrous flood in 1982, when almost all communication lines had collapsed. Currently there are 100 birds in Cuttack and 50 in Angul for display purpose while four constables and one sun-inspector ranked officer are engaged for their maintenance. The state government spends Rs 5 lakh per annum for the pigeon service. Thank you JustVish for allowing us to embed the video in our article. You can visit their YouTube channel at https://www.youtube.com/justvish. Visit their channel and inspire them to make such great videos.